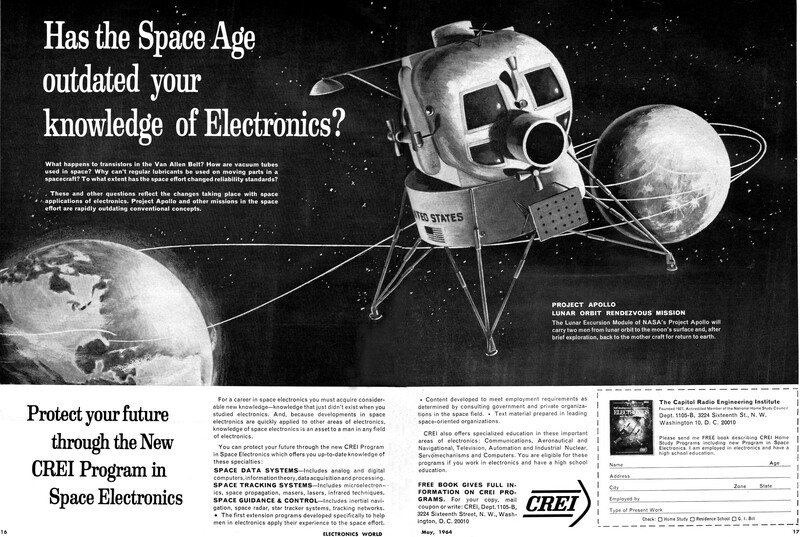 The Space Race was at its peak in 1964 when this advertisement by the Capitol Radio Engineering Institute (CREI) Program in Space Electronics appeared in Electronics World magazine. Although it all began in 1957 with the International Geophysical Year, the heat was turned up that year when the USSR successfully launched Sputnik 1, the world's first artificial satellite. President John F. Kennedy made his famous speech before the U.S. Congress in 1961, where he said in part, "This nation should commit itself to achieving the goal, before the decade is out, of landing a man on the moon and returning him safely to the earth." A huge push was made by colleges and technical schools to educate as many engineers and technicians as possible to ensure there would not be a dearth of qualified people to get the job done. Has the Space Age outdated your knowledge of Electronics? What happens to transistors in the Van Allen Belt? 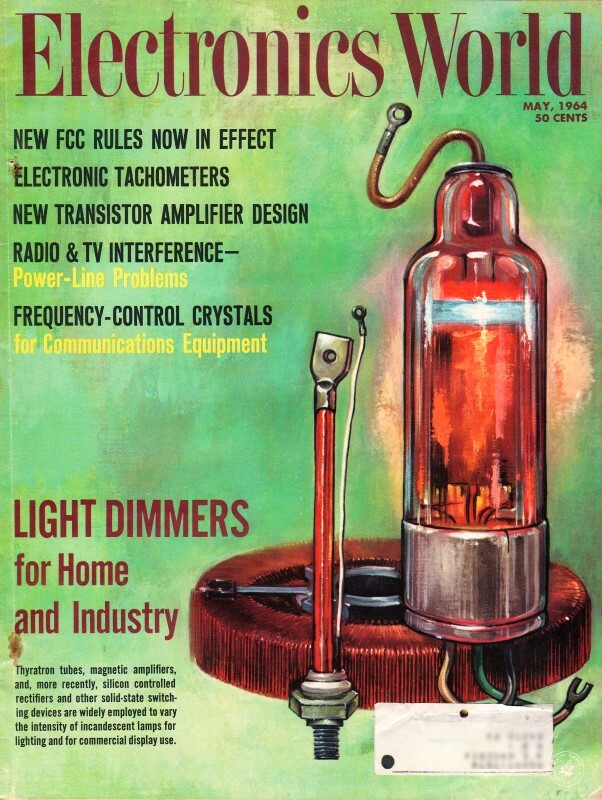 How are vacuum tubes used in space? Why can't regular lubricants be used on moving parts in a spacecraft? To what extent has the space effort changed reliability standards? These and other questions reflect the changes taking place with space applications of electronics. Project Apollo and other missions in the space effort are rapidly outdating conventional concepts. The Lunar Excursion Module of NASA's Project Apollo will carry two men from lunar orbit to the moon's surface and, after brief exploration, back to the mother craft for return to earth. For a career in space electronics you must acquire considerable new knowledge - knowledge that just didn't exist when you studied electronics. And, because developments in space electronics are quickly applied to other areas of electronics, knowledge of space electronics is an asset to a man in any field of electronics. Space Data Systems - Includes analog and digital computers, information theory, data acquisition and processing. Space Tracking Systems - Includes microelectronics, space propagation, masers, lasers, infrared techniques. Space Guidance & Control-Includes inertial navigation, space radar, star tracker systems, tracking networks. The first extension programs developed specifically to help men in electronics apply their experience to the space effort. Content developed to meet employment requirements as determined by consulting government and private organizations in the space field. Text material prepared in leading space-oriented organizations. CREI also offers specialized education in these important areas of electronics: Communications, Aeronautical and Navigational, Television, Automation and industrial Nuclear, Servomechanisms and Computers. You are eligible for these programs if you work in electronics and have a high school education. Please send me FREE book describing CREI Home Study Programs including new Program in Space Electronics. I am employed in electronics and have a high school education.